The existing ductile iron outfall at Jurby on the Isle of Man had exceeded its design life, and having been repaired many times, needed to be replaced. 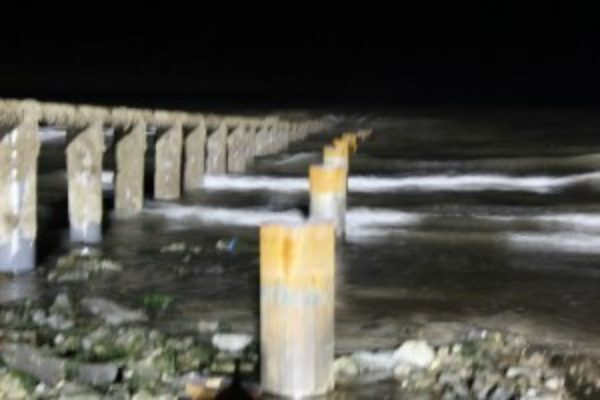 A major consideration for the Isle of Man Water Authority was that the external protection around the pipe had to be completely impact-proof and also that the existing piers were unlikely to provide adequate support for the new pipe as it stretched nearly 300m down the beach. Auldyn Construction appointed Dew Piling to deliver the £72,000 contract to design and install new piled supports which utilized 23 No 508mm tubes with a wall thickness of 16mm designed to not only support the new pipe but to delay long term corrosion and provide sufficient driving resistance to penetrate the sands and cobbles. Dew Piling completed the works in one week, the only suitable one week tidal window in a 6 month period, with the site team utilizing every available low tide opportunity both day and night.